Japan's HTV-7 cargo ship is grappled by the International Space Station's Canadarm2 on Sept. 27, 2018. 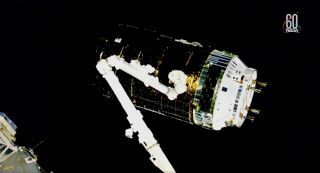 A robotic Japanese cargo vessel has arrived at the International Space Station (ISS), five days after lifting off. The orbiting lab's big robotic arm grappled the uncrewed HTV-7 resupply ship at 7:34 a.m. EDT (1134 GMT) today (Sept. 27), while the ship and station were cruising 251 miles (404 kilometers) above the northern Pacific Ocean. HTV-7 was fully berthed to the ISS by 10:09 a.m. EDT (1409 GMT), NASA officials said. "We're delighted to see HTV-7 arrive at ISS," NASA astronaut Drew Feustel, the commander of the station's current Expedition 56 mission, said as he thanked the teams in Japan and NASA for their work. "It's always breathtaking for us to see another spacecraft orbiting alongside the space station and join up on this incredible international journey in space." Feustel and his crewmates can now begin off-loading the cargo HTV-7 brought up: more than 5 tons (4.5 metric tons) of food, fuel, supplies and scientific hardware. HTV-7 launched atop an H-II rocket from Japan's Tanegashima Space Center on Sept. 22 at 1:52 p.m. EDT (1752 GMT; 2:52 a.m. on Sept. 23 Japan standard time). "HTV" is short for "H-II Transfer Vehicle." As its name suggests, the current mission is the seventh overall for the HTV, which is also known as Kounotori (Japanese for "white stork"). HTV is one of four robotic spacecraft that carry cargo to the ISS. The other three are Russia's Progress vehicle, Northrop Grumman's Cygnus freighter and SpaceX's Dragon. The SpaceX craft is the only one designed to be reusable; HTV, Progress and Cygnus vehicles all burn up in Earth's atmosphere when their orbital work is done. There are now five craft attached to the ISS: HTV-7, a Progress freighter, two crew-carrying Russian Soyuz spaceships and the Bigelow Expandable Activity Module, an inflatable habitat built by Nevada company Bigelow Aerospace that's getting an extended test run in orbit.